From the ruins of hours of multi-channel recordings created during his residency at EMS Stockholm, Francisco Meirino has created a definitive statement of time and discovery. Inspired by the Serge and Buchla modular synthesizers, he felt as if he were standing before ancient ruins, familiar yet unknown. After allowing these recordings to sit and decay over time, he discovered, when he finally came back to them, that all that was left were the pieces and ruins of sonic archives. Assembled and mastered at Shiver Mobile, Lausanne, 2015-2017 and at EMS Elektronmusikstudion, Stockholm, 2016. Francisco Meirino : synthesizers [ eurorack, serge, buchla ], field recorders, microphones, computer, reel-to-reel tape recorders, homemade electronics and electro-magnetic sensors. Collages and layout - Francisco Meirino. 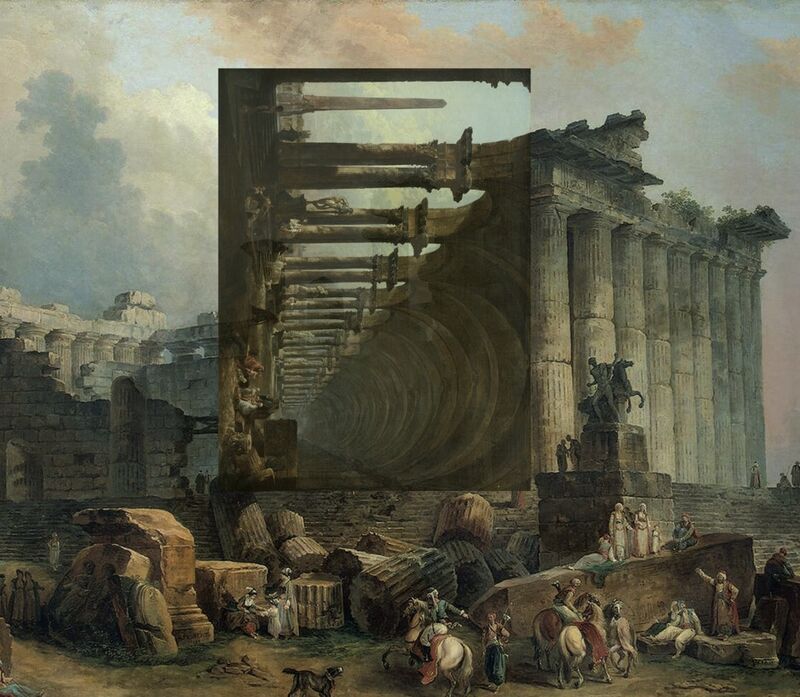 (public domain) Paintings - Hubert Robert, Joannes Hermans. When one hears the phrase “old tapes,” one thinks of repetitive messages engrained in one’s subconscious. Francisco Meirino owns a more physical set of old tapes, “the pieces and ruins of sonic archives.” These had been set aside and forgotten while they decayed, or more properly matured like fine wine or cheese. Where some might see sonic wreckage, Meirino sees something worth salvaging. 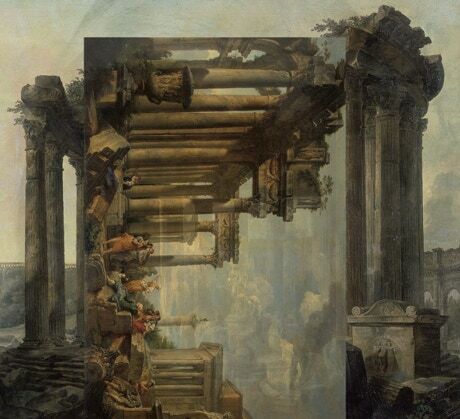 When we encounter the ruins of old buildings (as collaged in the cover art), we may admire them more in their decrepitude than we might have in their glory; the same is true of these sounds. The Ruins taps into our own subconscious, offering alternative readings of sounds clear and concise (such as a cough) to those beyond recognition. The deep bass of “Exposition” makes it the most musical in a common sense, but the ticktocking of “Rising”, with one simple marker to indicate tempo, indicates the way in which a single variable can be enough to form a wider impression. The mind seeks to perceive patterns, even when none are apparent or even present. Only when the dynamic drone that engulfs this piece gives way to a coda of clock does one sense the hand of the composer and breathe a sigh of relief, knowing that these constructions are anything but random. One of the most fascinating segments is one of the album’s quietest: a sequence of high-pitched right-to-left tones that disorient the listener (especially in headphones). Sitting at the center of the album, this sequence serves to highlight the way in which perceptions can shift according to context. Once the longer, stronger tones roll in, the effect is obscured, although one knows that it is still there. This is a testament to the fact that a loud message may not be as important as a soft one. The connection to conversation is made as both dynamics are replaced by a combination of electronic treble (which continue to wander between the poles) and vocal loop. By “Falling,” the sound of industry has taken over, as metallic grinding meets the buzz of wiped tape. In this piece, the only organic sound is that of an un-oiled creak. Here and in the ensuing track, one comes to the realization that tape squeak and birdsong have much in common; the difference is that while in the 1970s we asked, “Is it live or is it Memorex?”, in 2018 we know that these recordings have been adulterated. The medium, though possessing no consciousness, has become the co-composer.